Early childhood is the stage at which education can most effectively influence children’s development. Reliable information on ECEC systems in Europe is essential in order to understand what challenges are facing European countries, what we can learn from each other, and what new solutions might be developed to meet the needs of the youngest members of society especially when it comes to food. There are many surveys that prove the role of nutrition in the holistic development of children. supports rural economies and the diversity of rural culture through an emphasis on local products that keep food miles to a minimum. 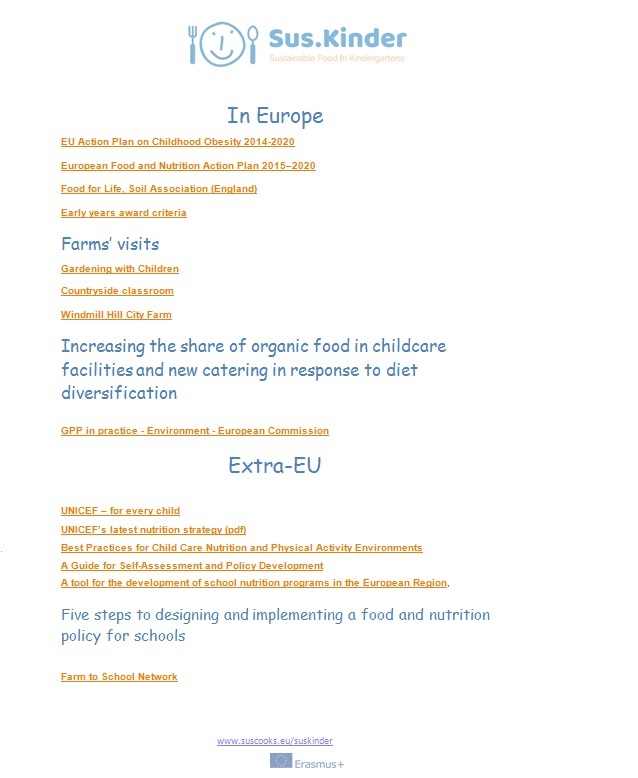 A list of good practices in Europe and beyond can be found in Module 1 Resources, Further reading that show the interest of modern society to work towards more sustainable food consumption in early childhood. Interdependencies between healthy children, food or caterer choice and procurement, environment and climate are essential for strong local food systems. Nutrition education curriculum must make the connection between local food systems, garden-based learning and kindergarten food services and contribute to developing sustainable food culture und healthy eating habits in early childhood. The link between the environmental and education perspectives can be achieved through networking among different actors. By raising children 's knowledge about the environmental impact of food produce and involve them in the food process, from product to plate, we help them to understand what and how we eat and the impact it has on our personal health and the environment (E.g. food waste; vegetarian food which has a much lower CO2 emissions and so on). Children and parents can be involved also in the preparation and presentation of the food. Kindergartens can contribute to create a better local distribution network for local producers. There are many examples and more can be found in Module 5.